Preheat oven to 350 degrees F. Grease a baking dish large enough to hold all the peppers. Bring a 6-quart stock pot 2/3 full with water to a boil. Trim off tops of peppers and carefully remove seeds and pith. In 2 batches, par boil for 10 minutes. Use tongs to remove from pot; cool upside down on a large plate. Meanwhile, in a large skillet over medium heat, heat oil. Add onion and garlic; saute until onion is transparent. Add meat, use a spoon to break it up and cook until no longer red. Drain and discard juices. Stir in rice and all remaining ingredients, except reserved cup of tomatoes. Spoon mixture into peppers. Place, top side up, in greased baking dish. 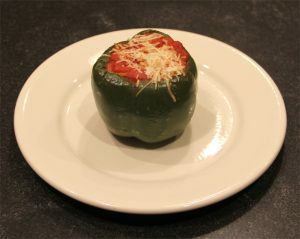 Top each pepper with approximately 2 tablespoons of reserved crushed tomatoes and sprinkle with grated Parmesan cheese. Bake uncovered until peppers are tender, forty minutes. Serve while hot. Red peppers will be sweeter than green ones. Serving suggestions include steamed corn and tossed salad. 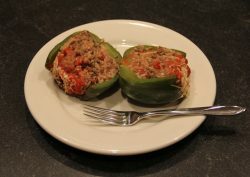 Stuffed peppers do not freeze well.